They were the most powerful nations of their time: the Carthaginians, Romans, Hellenes, Egyptians and Persians. Pergamemnon assembles together all of these peoples for the epic showdown. Each side may also conjure mythical creatures in order to influence the battle in its favor to gain the victory. 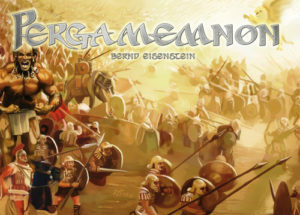 Pergamemnon is a deck-building game of direct conflict, thus including plenty of interaction! » German rules (4,5 MB). » English rules (4,5 MB). » French rules (4,5 MB). » Dutch rules (4,5 MB). » Korean rules (1,2 MB). » Japanese rules (2,2 MB). » Portugese rules (5,3 MB).